I was talking to a fellow in Australia for an article I'm writing for The Economist, and he started talking about a Heath Robertson machine. I had to stop and think--who is Heath Robertson? Do I know a Mr. Robertson? Did he invent some part I should know about? The fellow stopped and said, "Oh, do you call it that in America? 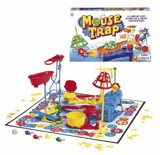 We call something that has many parts--like the game Mousetrap." I said, "We call that a Rube Goldberg machine in America."